Prof. Mark P. Foster spent his formative years in Maturin, Venezuela, before returning to the US to attend high school in upstate NY. He earned a BS in Chemistry from the University of Illinois, Urbana-Champaign, and a PhD in Natural Products/Medicinal Chemistry from the University of Utah. He received an NIH NRSA postdoctoral award and was American Cancer Society Postdoctoral Fellow in the laboratory of Prof. Peter E. Wright, in the Department of Molecular Biology at The Scripps Research Institute, La Jolla, CA, where he learned to apply high-field NMR spectroscopy to problems in macromolecular structure and function. Dr. Foster’s research has been supported by grants from the American Cancer Society, American Chemical Society/PRF, American Heart Association, Milheim Foundation for Cancer Research, The National Institutes of Health, and he was recipient of a CAREER Award from the National Science Foundation. He has served as Director of the Structural Biology and Molecular Biophysics Division, OSU Biophysics Program, Chair of the Department of Biochemistry, and Vice Chair of the Department of Chemistry and Biochemistry. He has served as ad hoc grant reviewer for many non-profit granting agencies, including the ACS, AHA, NSF, NIH, Science Foundation Ireland, Israel Science Foundation, Swiss National Science Foundation, and Burrows Wellcome Trust, and served as a standing member of NIH molecular biophysics study section MSF-C. He also served on the External Advisory Board for NMRFAM. He is a member of the American Chemical Society, Protein Society and Biophysical Society. At OSU Dr. Foster trains graduate students in Chemistry, Biochemistry and Biophysics, and is a member of the OSU Biophysics Graduate Program, Chemistry-Biology Interface NIH Training Program, and Cellular, Molecular, and Biochemical Sciences NIH Training Program. 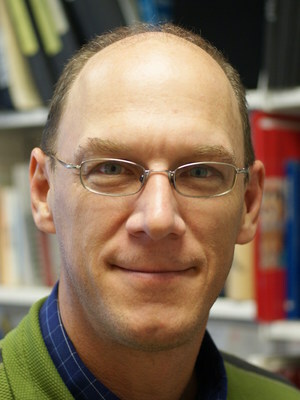 More information about Dr. Foster’s research interests can be found on his laboratory page, at http://go.osu.edu/fosterlab. Protein and nucleic acid structure and dynamics; molecular recognition; gene regulation; enzyme catalysis; NMR spectroscopy; molecular biophysics; thermodynamics; kinetics. The Foster group uses nuclear magnetic resonance spectroscopy (NMR) and other biochemical and biophysical techniques to understand the structure and function of biological macromolecules, and to decipher the ways in which they recognize and interact with each other. Our group and our collaborators tackle a range of fascinating questions that allow us to understand how genes are regulated (turned “on” or “off”), how enzymes catalyze chemical reactions, or how drug-like molecules bind and inhibit their cellular targets. Such insights are fundamental to understanding biology and for applying that knowledge to problems in medicine or biotechnology. Members of the lab receive both broad training training in biochemistry, biophysics and structural biology, and highly focused training centered on their research project and the tools most critical to its advancement. With this combination of broad and deep research training, group members emerge with the scientific skills to pursue careers in a wide variety of settings, from academia to the private sector. Projects in the Foster Lab include interaction of retroviral integrases (HIV, MLV) with eukaryotic transcriptional machinery (LEDGF, Brd4), ligand-dependent binding of proteins to nucleic acids (TRAP, Loz1), enzyme dynamics (Cre recombinase, RNase P, ProXp-Ala), and RNA-mediated gene regulation (riboswitches). In partnership with our collaborators, we tackle fascinating research problems in a supportive, exciting and fast-paced learning environment. We invite you to visit the lab web pages (http://go.osu.edu/fosterlab) and contact us if you have questions or are interested in collaborations, or to learn more about our science. Crowe BL, Larue RC, Yuan C, Hess S, Kvaratskhelia M, Foster MP. Structure of the Brd4 ET domain bound to a C-terminal motif from γ-retroviral integrases reveals a conserved mechanism of interaction. Proc Natl Acad Sci U S A. 2016 Feb 23;113(8):2086-91. DOI. Epub 2016 Feb 8. PubMed; PubMed Central PMCID: PMC4776507. Ihms EC, Foster MP. MESMER: minimal ensemble solutions to multiple experimental restraints. Bioinformatics. 2015 Jun 15;31(12):1951-8. DOI. Epub 2015 Feb 10. PubMed; PubMed Central PMCID: PMC4542774. Ihms EC, Zhou M, Zhang Y, Kleckner IR, McElroy CA, Wysocki VH, Gollnick P, Foster MP. Gene regulation by substoichiometric heterocomplex formation of undecameric TRAP and trimeric anti-TRAP. Proc Natl Acad Sci U S A. 2014 Mar 4;111(9):3442-7. DOI. Epub 2014 Feb 18. PubMed; PubMed Central PMCID: PMC3948263. Kleckner IR, McElroy CA, Kuzmic P, Gollnick P, Foster MP. Homotropic cooperativity from the activation pathway of the allosteric ligand-responsive regulatory trp RNA-binding attenuation protein. Biochemistry. 2013 Dec 10;52(49):8855-65. DOI. Epub 2013 Nov 22. PubMed; PubMed Central PMCID: PMC3946311. Amero CD, Byerly DW, McElroy CA, Simmons A, Foster MP. "Ligand-induced changes in the structure and dynamics of Escherichia coli peptide deformylase." (2009) Biochemistry. 48(32):7595-607. DOI (PDF, SI). Addendum.